Tweet Read more	Enter your password to view comments. We’d celebrated Hari Raya and also Deepavali in the same month. For us, it’s really just a holiday break. For the girls, it was a time for them to discovered the differences in each of this celebration. Zara drew this in school for Hari Raya. She knows there’s ketupat and the pelitas (some type of Malaysian wall candle sconces or oil lamps) in this celebration. And then for Deepavali, she realises that there’s Kolam drawing every where, and she made one herself on paper. Zaria, not to be outdone by Zara, did a drawing too. She has been very proud of her drawing, and kept showing it to us. Can you tell what she tried to draw? Here’s her answer : “See, my birthday cake drawing. I draw (drew) decoration on the cake. They are sweets. This is the baloon. See, Daddy and mummy is (are) also there. My picture got present also.” Zara helped to write Zaria’s name, and put in the words (ok, she spelled that phonetically); she also drew Zaria next to Daddy and mummy, drew a present (which Zaria later coloured), and also some candles on the cake. On Saturday after work, we attended my cousin’s daughter, Monique, 1st birthday. It was held in a hall of a club. When we arrived, the girls were immediately invited to join the crowd at the stage with other children for some entertainment by a hired clown. Both didn’t even complain and just sat down among strangers and watched; while Daddy and I joined my other family members at a table. Girls were taking care of each other, and I was very glad to see Zaria participating in games and dance without any of us adults coaxing. Here are the photos of the day. Zaria watched the clown intently when he was doing some magic tricks (the stern look stayed on the face for a long time). Zara and Zaria were watched over by Sam or Ally. 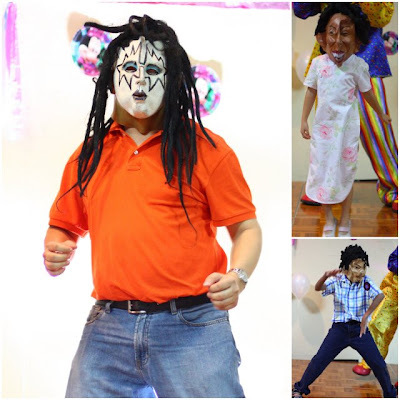 Girls joined in action dance with the clown leading, and also went on stage to dance together with the other children. Zaria loves the toy that Zara got for going on stage. Monique, the birthday girl, waiting to cut her cake. 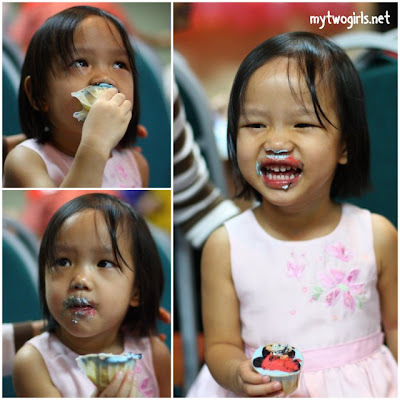 And Zaria, finally smiled and laughed, when she made a mess with her cup cake. Saturday was a busy day for us all. Besides working (yes, it was a working weekend for me), we attended the girls’ sports day in the morning and my cousin’s baby’s birthday party in the evening. 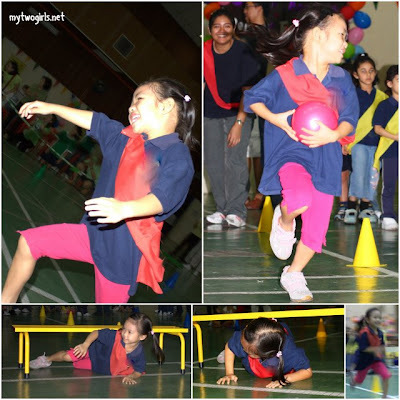 The girls have been practicing for the sports day events in school daily in the morning for a month. Daddy, who’s the one who sends the girls to school told me our girls can really run and do all the sporty stunt. I was looking forward to see for myself. We arrived at the rented hall and met with a good crowd, had some breakfast and waited for the event to start. The sporting events started after some speech giving, and good that they kept that short. 1st event, the kids have to run a short distant, crawl under a bench, run another distant, u-turn back and run to the same bench, crawl under it and run back to the team. 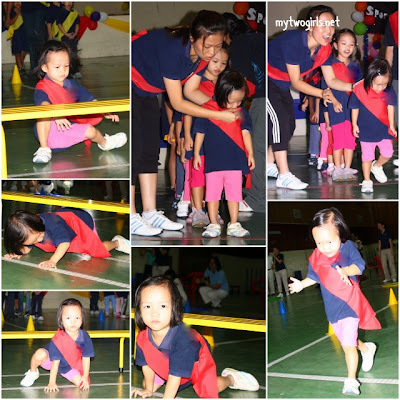 2nd event, the kids have to hold a bean bag with their chin, run a distant, u-turn back and run back to their team. 3rd event, the kids have to hold a ball, run a distant, u-turn back, and run back to their team. 4th event, the kids have to use a hoop to drag a ball a distant, u-turn back, and then drag the ball bag to their teams. And Zara runs like the wind (actually I call her Dash, after the boy in The Incredibles). All our daily trip to the park, and getting them to race in the park for exercise does help. My only regret, our lousy camera couldn’t get good photos with the girls in motion. (Just see how crappy the photos look like). After the 4 events, they have a short break. The parents then joined in the fun. Mummies formed a human chain, and passed rubber bands with straws. See in 5 minutes, who passed the most rubber bands. Parents joined in baloon fight, see which team remained with unburst baloons. And then there was also family drawing competetion. Although Red Team came third place overall, everybody got their prizes, and everybody had a fun day. Well done, school! And Bravo Girls! 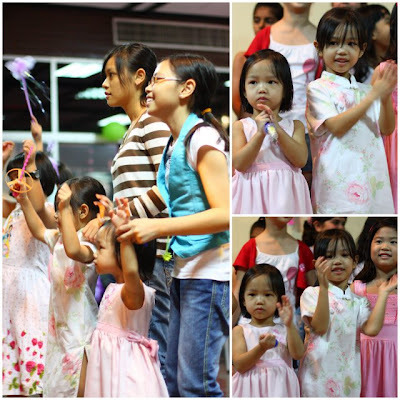 Last Friday, the last day of school term, the girls’ school had a Fathers’ and Mothers’ Day celebration. It was a small event with simple breakfast, followed by song singing by the children. The children also were called on stage to present handmade (supposedly by the children) flowers to their mothers and hand painted t-shirts to their fathers. This is the only shot I took of Zaria singing. When she saw me looking later, she started crying and wanted to be with me. The girls then stayed back for the rest of the school hours to play games. Just ranting a bit to get it out of my system. Although I very much would like to join my side of the family for the big re-union dinner they were having (all my 3 siblings and their family were dining at my sister’s place), I had to fulfil my obligations as a DIL. This is the 2nd year we have re-union dinner at our place instead of MIL’s, and we have steamboat again. Next year maybe we should change the menu because all the girls had was just fish balls, nothing else. They didn’t even bother to try the RM90/Kg Sou-Mei (è‹çœ‰) fish (btw, it wasn’t worth the money as it’s really not that delicious) nor the big prawns. Her reply was, “Mandarins! A lot of mandarins.” She actually forgot she will be getting ang pows since she still has no concept of money, and she loves mandarins. On Chinese New Year’s day, as usual we visited my MIL first before going over to my brother’s place where the whole family met. This year, the girls cousin wore the same clothes. I bought 2 sets of similar cheong sam from my Beijing work trip last May for the girls and their cousins. Zara’s and Sam’s are the same, Zaria’s and Tasha’s are the same. I didn’t get any for Ally as they didn’t have her size. The girls were so happy to see their cousins wearing the same dress as them. After a simple lunch, we carried out our yearly tea ceremony to get the big ang pow from my dad. Zaria serving tea to Ah Gong, my dad. And then we visited my 90 year old grandfather in Kajang. No photo of my strong grandfather, since we forgot to take the camera down. Zaria chipped in, “Biscuits!” (the part she likes about Chinese New Year). Happy New Year and æ­å–œå‘è´¢ Every One! Hope you have lots of Ang Pows, Mandarins and Biscuits! After 1.5 months of blog break, I got what I needed to do done, well, almost. During this time, no watching DVDs, no book or blog reading, trying to be very focussed. What did I do this 1.5 months? Worked really really hard and long hours of course, just before the long break. Completed the 8 photobooks just in time!! Celebrated Zara’s birhtday with some planning. Celebrated Zaria’s birthday almost last minute. Found a new school for Zara and Zaria. Went on a week’s holiday. Did whatever minimum housework that I needed to do. My 4 weeks leave is almost over. The girls will be starting in a new school next Mon. Jelly will be back next week, and I’ll be back to work on Thurs! Here are peeks of what went on in the household. Zara’s birthday, celebrated with the family and neighbours in the house. I baked her ‘birthday cakes’ this time. Zara with her ‘fairy’ cakes. Zaria and Tasha blowing off candles over and over again on a couple of the cupcakes. Christmas was celebrated at my bro’s house. With my nephew’s band performing. My niece, Ally, being the Santarina. My niece, Sam, did some magic tricks to con awe the below 5. Of all presents, Zara loves the musical jewelry box from King’s Wife. Seen here the girls gazing at it. Zaria’s birthday was planned very last minute. Without a maid, we just had KFC and Dominos Pizzas, and cupcakes from Cupcake Chic. You think she’ll be thrilled to get to blow her candles? Wrong! She cried when the birthday song was sung. Not sure if it was because someone turned off the lights, or accordingly to her, “I don’t want Ah Ku to sing.” (Ah Ku, i.e. my brother, some one Zaria fears). 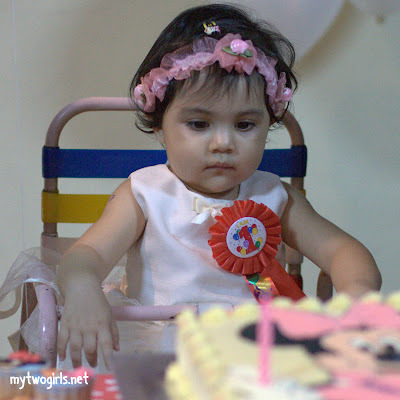 And Zara sulked big time, claiming it’s not her birthday, so she didn’t want to participate. Grrrrr..
And here is a sneak peek of our week long holiday. Can you tell where we went? (Those who were told of the trip should not review the answer). The post will come later. We went over to King’s Wife‘s place on Saturday so that the kids could play with fire lantern together with their cousins. Before dinner, it was jamming time. Guitar is getting so popular all the older kids know how to play it. This nephew of mine has joined a band. This can probably be his cover shot if he produced an album. After a take away dinner, we all went to light the lanterns and strolled to the park to enjoy the night. It was a hot night but the sky was clear. The kids upon seeing all the candles litted by the other kids, left their lanterns totally and joined it. Blowing candles after singing Happy Birthday, lighting more candles, etc. Zara and Zaria had their first taste of ‘playing’ with fire, and even though occasionally the wax dripped on their fingers and they yelped in pain, they went on. King’s Wife’s nephew, Wei Hao, lighting candles. More birthday song singing for Zaria to blow off the candle. When it was time to leave the park, Zara protested. Mummy I want to do some more grave yard thingy.” …. It took me a few seconds to realise that she was relating lighting candles with graveyard because that’s what we do when we pay our respect in my mother’s grave.